What is a Standard Operating Procedure (SOP)? How to create an effective SOP? Home / CSense OATs How to write a simple but effective SOP (Standard Operating Procedure)? How to write a simple but effective SOP (Standard Operating Procedure)? 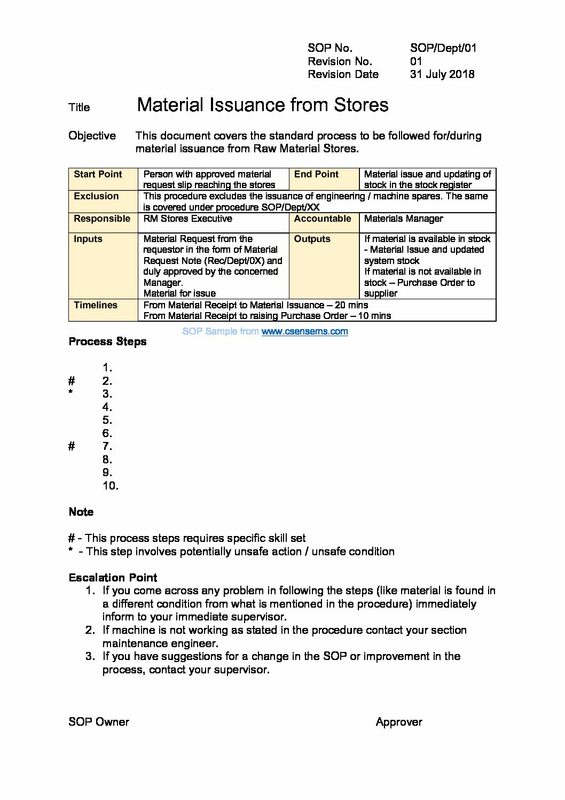 SOP or the Standard Operating Procedure is a document that describes how to carry out a sub-process (or a short process). Trainers/superiors who provide training to the new employees. How do we run the business? In other words, what is our business model? How do we achieve each of the process steps mentioned in business level? We normally accomplish them with the contribution from Key Functions. Process Improvement, Technology up-gradation etc. When we further break down the Functional process steps, we will come to know that each of these steps includes numerous inner steps. These inner steps are broadly called as Processes. Generally, people and the overall business processes are classified into various departments based on the Level 3 process they conduct. Departments would include purchasing, raw material storage, material issuance, production, finished goods storage, despatch to customers, billing, quality inspection etc. This level also includes the Sub-processes – one process is done through multiple sub-processes. This is the granular level view of how we conduct a sub-process. The Value / Non-value analysis can be done at this level. An SOP becomes useful and effective ONLY when it covers only one sub-process. How to create a simple Standard Operating Procedure? State any exclusion that is some of the process steps that you do not want to cover in this procedure. Identify the person/team who are going to use this procedure. Determine their language of comfort and gasping level. It is always better to create the procedure in the mothertoungue of the people who are going to use it! Best way to create a standard operating procedure is to ‘co-create’ it! Meaning the most experienced staff, most skilled workmen and the team working in the process has to create their own procedures ably supported by the management. Prepare a list of activities to be done in the right sequence. What is the importance of each step with respect to Safety, Quality, Productivity and Cost? State the decision-making steps clearly and cover all the possible options. Include the DON’Ts, because throughout the document we are saying what to do and how to do. But, we also need to specify what not do and how not do in the critical process steps. Select 3 sets of staff to test the effectiveness of the SOP and the correctness of steps. Ask them to do the job (sub-process) only based on the draft SOP. Collect their feedback and fine-tune. If the junior level staff accomplishes the process with the acceptable level of outcome, then we can affirm that the overall flow of SOP is right. Once the draft procedure is accepted by the people doing the job, approve the document, make it a valid and approved document. Assign a serial number to the procedure. You may simply maintain the sequence like SOP-01, 02. Mention the date of issue and/or the date of revision. The serial number and the revision number with the date will help us in identifying the relevance of the document. It will also help us to ensure that we are using only the updated document. Mention on the document who has created the SOP (the person/people involved) and they become the owners of this procedure. Mention who is approving the document, preferably with signature and a stamp. This will ensure that the SOP is not tampered with by anyone. Keep in mind that the SOP is not eternal and not final. It has to be reviewed for correctness at regular intervals. Generally at an interval of 6 to 12 months. The SOP will help us to standardise the best way of doing the job. By providing a procedure for a sub-process, we are cementing the way we need to do the subprocess by everyone at all the times. But we need to provide appropriate channels for communication from the users about the need for change / improve the procedures. One picture equals a thousand words. Hence, try to convert your SOPs into visual SOPs. Add pictures and photographs as necessary. Use different colours – to highlight important points. A better way is to convert your procedure into a flow-chart. Because flow charts can reveal more information at a glance than reading through the procedure. We can indicate the decision-making points with all possible outcomes of the decision (if accepted then what to do and if rejected then what to do). List down all the inputs required to do the job as per SOP; including materials and information. List the expected/possible outcomes from the job. Mention the points which need specific skill sets (for example, setting up on a machine, changing the computer controls etc). These points will become the opportunity for improvement in future. Mention the timelines, ie., time allocated to complete each step or the allowed lapse time between each step. Clearly spell out the person responsible and person accountable for the carrying out the job. Specify the escalation points.